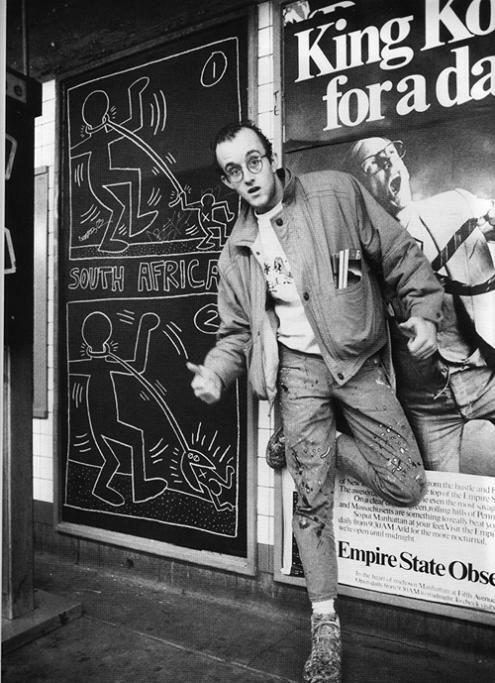 May 4th would've been Keith Haring's 50th birthday. To put it bluntly, Haring's art made me -- dare I say it -- happy. It was bold, colorful, direct. I loved that he didn't title things, leaving the interpretation up to the viewer. I love that he had such a strong affiliation with children. He did installations at Children's Hospitals and Museums, and often ran workshops for kids. Art, for him, was all about accessibility and understanding, for children, commuters, everyone. And then he announced he had AIDS, and watched (I wonder how) the value of his art begin to soar in front of his eyes. Haring died February '90, during my Junior year. He was 31. His funeral was held at the cathedral across the street from campus. The '80s were overshadowed by this new disease that seemed to strike down young men in their prime. It was unrelenting, and it was heartbreaking. I remember watching a Nightline ep on a man watching his lover die. I knew very little of gays in Arizona (although I would come to discover three of my classmates were as was my 5th grade teacher), but I really didn't need to in order to choke back tears. People's lovers were dying. People's sons were dying. I'm incredibly impressed and grateful that medical advancements made it possible for so many to go on leading productive lives with this disease, but often wonder what our lives would be like if some of these men had lived: what would Haring be doing today? Would his art have changed at all? What political messages would he espouse? (during his brief life he took on a myriad of causes including HIV/AIDS, literacy and anti-apartheid) Would his art have been incredibly expensive, as it is today in its finite set, or would it have been completely accessible as he kept signing skateboards and freewheeling spray paint on subway walls? I'm such a fan that I get email announcing benefit parties for Haring's 50th (not a date I had memorized). And I suppose when I saw this message arrive in my in-box, after the year I'd had, I could've reacted in one obvious way: so what. At least Haring got to express himself, got to love, got to interact with children. He left his mark, and my baby didn't even open her eyes. But you know, quite contrary to that, I was just sad. The lost potential of the famous somehow only magnified the lost potential of my own. Would she have been an artist? Someone who cared about children? How is it we can birth children and nurture and care for them only to have them struck down later in life by things we can't control? I obviously didn't know Kieth Haring personally although we lived in the same borough, at the same time. But his work touched me deeply, and thus his death touches me too. I miss you. Happy Birthday. I think at some point last year when Mr. ABF began discussing his memorial tat and whether I was interested in partaking of ink to skin, I mentioned this sentiment and how wholly inappropriate I felt it was now. The happy shiny baby? No thank you. But when the email arrived with the icon at the top, it somehow struck me differently: is it the radiant baby? the one that shines despite it's one-dimensionality? The imagined joy, scribbled with one deft thick black line and a few dashes around? Merely an icon, never to be realized in life? Haring never had children, so what was it about babies he was trying to say? Were they happy? Or did they represent some light? A flicker of possibility? of hope? It hit me that Maddy is this, the never-ending radiating pulsation within my mind and heart. For some reason, especially today, it still seems appropriate. Something to think about, you know, next time I'm strapped down in a tat parlor in need of inspiration. Happy Birthday, Keith! Thanks for the joy! I love this, Tash. The ode to Keith. The radiating baby. I love how you have been able to link it to Maddy. It's beautiful in its simplicity. I love it. I've never been into the whole tattoo thing, but recently have considered doing something more permanent than deadbaby jewelry to memorialize C. I have yet to find something that resonates with me. Reading this though makes me think I have just been looking in the wrong places for meaning. What a nice tribute this post was to this artist. I like how you can look at that picture and find Maddy in it. He really was too young to die. It's funny that the older I get, the ages that I used to think were sooo old are now sooo young to me. But even though his life was short, he made a mark and left an impression. And that is a great thing. So, is Mr. ABF getting a tat? What is he getting? What an amazing man. Thanks, Keith! And thanks, Tash, for sharing this. Good art just keeps giving. i too love Keith Haring, though i went to college in a place so far, literally and figuratively, from NYC that i was a lot later in discovering him and he was already an iconic memory. the radiating baby fits. beautifully. happy birthday. thanks for this post...it's going to float around in my head for awhile, i think. I didn't know much about Keith Haring prior to college, as my art education classes in secondary school wouldn't dare talk about a gay man, let alone one who died of AIDS. Oh, the terror of such a thought! However, once in college, I found the man and his art so interesting, I wrote a couple of papers on him. Your thoughts on the image make sense, even if, as you say, it wouldn't initially appear that way. I think it's perfect. I love Keith Haring, sooo cool. I share your love of Keith Haring and the PopShop. This post made me sad, missing something/someone. This is beautiful. All of it, the tribute, the radiating baby. Truly all of it. I love the idea of a Tat, however, I am not into needles. That being said it has been a thought for some time now. It'll more than likely remain just that unless, I can get Williams birthstone color done all around my ring finger on my right hand. That would be my only way I do believe. Once again this is gorgeous. Happy Birthday to Keith. Thinking of you and your radiating Maddy! Thanks for the post. I am the least tatoo person in the world but I have my dead daughters name tatooed on my foot. I like having it there. She's always with me. And because she's on my foot she's there when I step out into the world, when I connect with the earth. What you say about your daughter is true. She is a light that is always inside you. 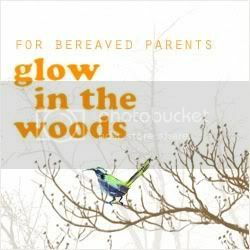 My daughter was slowly dying inside me for two months and during that time my nerve often failed. But hers never did. I'd feel her little feet kicking and amost hear her say, 'Come on Mum. You're OK.' Sometimes I still hear her speaking to me and she says, 'Mum I didn't die so that you could become a nasty, small, bitter person. I died so that you could become someone better. So what are you going to do about it?' Pretty bossy, my daughter. But her words help. I'm sure Maddy speaks to you too. Thank you for reminding me of an artist who brought me a lot of joy when I was a screwed-up young man. I considered for some time getting a little band of his dancing men tattooed around my arm or leg, but the idea went away at some point. I'm thinking now that maybe I should reconsider it. Thanks Tash, this was so wonderful to read. I love the last paragraph best. "the never ending radiating pulsation", that is lovely and so accurate of what our lost children are to us. I never knew all that about Keith Haring, thank you.